Chicken soup isn’t just good for the soul: the healing benefits of bone broth are incredible. It’s nutrient-dense, easy to digest and is the number 1 thing you can consume to heal digestive issues, detoxify the liver to reduce symptoms of leaky gut syndrome including allergies, food intolerance’s and sensitivities, joint and muscular pain as well as a giving general boost to the immune system. Our ancestors would eat far more collagen than we do today, because they used to eat the whole animal, including cartilage, skin, and other collagenous proteins, nowadays we ignore the bones, organs, and cartilage and mostly just eat the muscle meat. Simmering overnight causes the bones and connective tissue to release one of the richest sources of vital minerals such as calcium, magnesium, phosphorus, silicon, sulphur and others in an easily absorbed form and other anti-aging, healing nutrients, including collagen and amino acids proline, glycine, glucosamine, glutamine and chondroitin which have an incredible power to transform your health and maintaining the health of your joints, skin, hair, and lots more as you age. Bone broth is most famed for healing the gut lining (Leaky Gut) and people such as Natasha Campbell-McBride (GAPS TM) and Dr Mercola are big fans. I was quite shocked when I first watched Dr Mercola’s video on How to make, especially when he added the chick feet to the broth, but we mustn’t forget how nutrient dense the bone marrow is too! Our modern lifestyles include an inflammatory diet and for a lot of people, there’s a lot of guts out there that need healing. Excessive sugar, salt, and gluten intake can cause damage to the gut lining, and not just in people that are Celiac. So if you want to heal years of gluten-damaged gut lining, bone broth will be your healing friend and also a great boost for your immune system. You can make it with either chicken or beef bones but you really need to choose animal products which are grass-fed, organic and free of antibiotics and hormones and include the body parts we don’t usually find in the supermarket such as the feet, neck and skin. 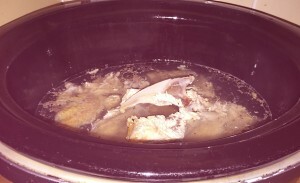 After a roast dinner on a Sunday, put all the chicken carcass in a hot pot, including the skin and set it on low and leave overnight. Strain off the juice, when it cools it will be a thick gelatinous liquid (Perfect, this is exactly what we want). To enjoy the healing benefits of nutrient-dense bone broth! Use the bone broth as a base for any gravy, soups or sauce recipes that call for stock or broth. Add Himalayan or celtic sea salt to taste and drink both as is, or store in fridge for a week or in a freezer in ice cube trays for up to 6 months. 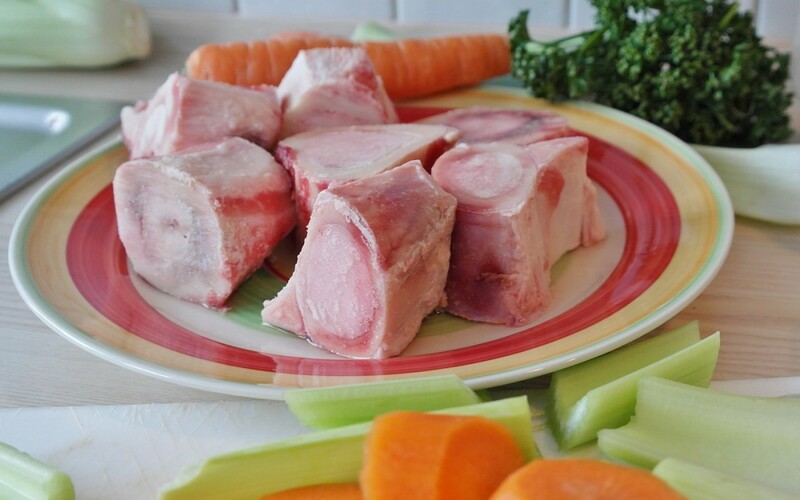 Enjoy this recipe for Bone Broth below! Add water and vinegar to pot till bones are completely submerged. Set on low and leave it overnight. Bring pot to a boil and then turn down to a simmer. Once the broth is simmering, skim of any scum off the top of the pot (scum does not always form). You will want the mixture to simmer for at least 24 hours, adding water as needed to cover the bones. During the last 30 minutes to an hour add in the garlic, handful of salt and cayenne pepper. Once the broth is finished, let it cool then drain it to ensure all the animal remains are removed. 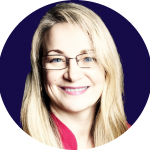 Kirsty Terry, founder of Equilibrium Health, is an MSc Functional Medicine Nutritionist and Bio-resonance Health Screening Practitioner. She works with you and your family to identify symptoms of leaky gut syndrome, which can lead to allergies, food intolerance’s and auto-immune disease’s such as IBS, Crohn’s and Colitis through to children with Autism Spectrum Conditions. She uses a range of modalities and technologies which are non-invasive, painless and a drug-free natural approach to achieve your optimum health and vitality!